I pledge that I shall abstain from the purchase of “new” manufactured items of clothing, for the period of 2 months. I pledge that I shall refashion, renovate, recycle preloved items for myself with my own hands in fabric, yarn or other medium for the term of my contract. I pledge that I will share the love and post a photo of my refashioned, renovated, recycled, crafted or created item of clothing on the Wardrobe Refashion blog, so that others may share the joy that thriftiness brings! So I will probably be doing most of my sewing blog posts over there, but I will try and link them here when they go up. I made Thai green curry for dinner to stave off the depression of the first Standard time early sunset. Spicy, wonderful nom nom noms! And hopefully to help me feel better. This weekend I spent a bunch of time fantasizing about a lovely, relaxing summer holiday here. My mom is just now flying back from here, which also seems about right for where I’d rather be right now. I did, after many false starts, finally book my tickets to Seattle for the winter holidays. Dec 20-28. I’m very much looking forward to that too. I didn’t do anything for Halloween, but come home and put on pajamas. Lame, maybe, but so relaxing. I’ve been thinking about my Gramma Marge and my Grampa Ray a lot today. El Día de los Muertos means honoring them. For a while now I’ve been wanting to make a standing El Día de los Muertos altar for them in miniature. I should perhaps take some time today to put down my plans for it so that I can start making the little pieces of it over the coming year. I will light a candle for them tonight. 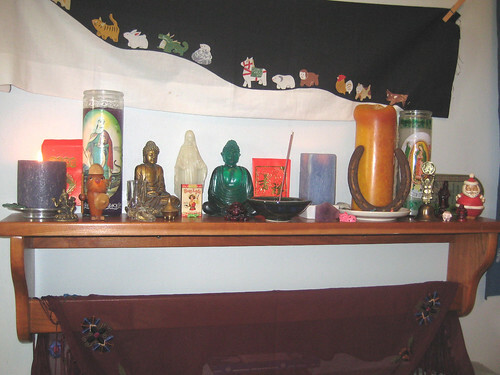 Picture today is my dining room fireplace “altar” for honoring the dead. Categories: craftygirl, heartsafire, mi familia, nom nom nom | Permalink.